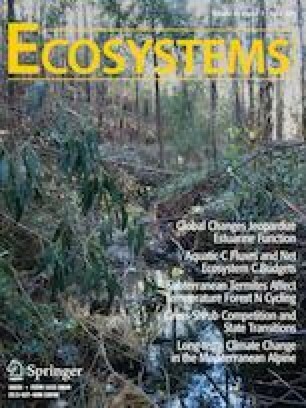 This study investigates the factors controlling the soil CO2 and CH4 fluxes and quantifies annual cumulative soil respiration (RS), heterotrophic respiration (RH), and soil CH4 emission in an undrained forest on tropical peat by continuous measurement using an automated chamber system for 2 years. Daily mean soil CO2 flux was increased by lowering groundwater level (GWL), which indicates oxidative peat decomposition is promoted by the enhancement of aeration. On the other hand, soil CH4 flux showed a bell-shaped relationship with GWL, which suggested that the development of anaerobic conditions promoted CH4 production by the rise in GWL, whereas hydrostatic pressure suppressed CH4 diffusion when the GWL was above the peat surface. Mean annual gap-filled CO2 emissions were 926 ± 610 and 891 ± 476 g C m−2 y−1 (mean ± 1 SD) for RS (n = 10) and RH (n = 6), respectively, and were not significantly different from each other. The annual RH in this study was similar to that of previous studies despite the higher annual mean GWL in this study, possibly due to the inclusion of litter decomposition in contrast to most of the previous studies in tropical peatland. Mean annual gap-filled CH4 emission was 4.32 ± 3.95 g C m−2 y−1 (n = 9), which was the high end of the previous studies in tropical peatland due to higher annual mean GWL in this study. In conclusion, RS was lower and CH4 emission was higher in the undrained peat swamp forest than those previously reported for drained and disturbed forests on tropical peat. RH, TH, YO, and LM designed the experiment; YI prepared the chambers; GXW collected the site information and meteorological data; RH, YO, GXW, LM, EBA, FK, KSL, KKM, and JWW performed the experiment; KI and RH analyzed the data; KI and TH wrote the manuscript; LM commented on details of the manuscript drafts. The online version of this article ( https://doi.org/10.1007/s10021-019-00376-8) contains supplementary material, which is available to authorized users. The authors would like to thank the staffs in Sarawak Tropical Peat Research Institute (TROPI) for their support during the study and Shun-ichi Nakatsubo at Institute of Low Temperature Science, Hokkaido University, for chamber preparation. Malaysian Meteorological Department (Sarawak branch) and Department of Irrigation and Drainage, Sarawak supported us to provide the meteorological data. This study was supported by the Sarawak State Government and was carried out under the Joint Research Program of the Institute of Low Temperature Science, Hokkaido University. Also, this study was financially supported by JSPS KAKENHI (no. 25257401), the Environment Research and Technology Development Fund (no. 2-1504) by the Environmental Restoration and Conservation Agency and the Ministry of the Environment, Japan, the Asahi Glass Foundation, and Grant for Environmental Research Projects from The Sumitomo Foundation. Moreover, this study was also partially supported by the National Institute for Environmental Studies (NIES) Internal Call for Research Proposals (A) of 2017 (Comprehensive evaluation of CH4 and N2O release from oil palm plantation and development of its reduction technique).